It had been a few years; some New York Yankees fans might say it seemed like an eternity. But eight years after the Yankees participated in their last fall classic, they were back in the playoff hunt, as the calendar flipped to September 1972. They entered the final month of the season in third place, trailing front-runner Baltimore by 1½ games and Detroit by one game. The long season had dragged on and Yankee skipper Ralph Houk was supplied with some fresh bodies from the minor leagues. Like most teams who were in a postseason frame of mind, the Yankees were gearing up for a final push. They were looking for a spark, an infusion of young talent, or to get a close-up look at the potential stars of the future. One of their call-ups was Charlie Spikes, a power-hitting outfielder who had been labeled “can’t miss” by almost everyone within the Yankee organization, and those from outside New York who coveted the prized minor leaguer. The 18,145 paying customers at Yankee Stadium on September 1 were there to see what the hubbub was all about. They were treated to a fine pitching performance by Mel Stottlemyre, who shut out the visiting Chicago White Sox by a 4-0 score. Stottlemyre was brilliant, scattering four singles and walking none. Spikes contributed to the win, leading off the second inning with a single to left field in his first big-league at-bat. He later scored on a sacrifice fly off the bat of Gene Michael. In the fifth inning, Spikes got his first RBI with a single off Goose Gossage. In the fourth inning the White Sox mounted their only threat of the night, getting two runners on base with one out. The 21-year-old Spikes showed some handy glove work when he made a diving catch of Mike Andrews’ sinking liner to right field, helping to snuff out the White Sox’ lone rally. Leslie Charles Spikes was born on January 23, 1951, in the lumber-mill town of Bogalusa, Louisiana. Charlie, his parents, twin sister Charlene, and their six siblings made up the Spikes household. Spikes was a top athlete at Central Memorial High School, excelling in baseball and football. “I had about 30 scholarship offers in football including Louisiana State University and the University of Alabama,” said Spikes, who was a middle linebacker. “But the Yankees came along and made a financial offer I just couldn’t refuse. It was too good.”ii Playing third base, Spikes led Memorial to the 1969 City Championship. He hit a home run in the title game for the lone tally, a 1-0 victory. Yankee scout Atley Donald’s report rated Spikes as “good” for agility, aggressiveness, power, arm, range, and habits.” He also wrote that “the ball jumped off his bat better than any player I’ve seen since I’ve been scouting.” As a result, the Yankees selected Spikes with their first pick in the June 1969 amateur draft. When Spikes reported to Johnson City, Tennessee, in the Appalachian (Rookie) League, it was his first time outside Louisiana. He progressed through the Yankees’ chain, having a breakout year in 1972 at West Haven of the Double-A Eastern League. Under manager Bobby Cox, the Yankees went 84-56 and won the league championship. Spikes was called up to the Yankees on Septe,mber 1 after leading the team in home runs (26), RBIs (83), doubles (27), triples (5), and batting average (.309). He had been anointed with the nickname the Bogalusa Bomber because of his tremendous clouts. Meanwhile, the Yankees and Cleveland had been talking trade for months, with Spikes and Indians third baseman Graig Nettles as the principal parts. Neither side would make a trade until each player was included. Finally, on November 27, 1972, the deal was made, with Spikes going to Cleveland with catcher John Ellis, outfielder Rusty Torres, and infielder Jerry Kenney, for Nettles and catcher Jerry Moses. Spikes got off to a bad start in April 1975, hitting just.151. He improved each month, but his batting average for the year was .229. He lost playing time because of his poor performance as well as the emergence of outfielder Rick Manning, who was called up in late May and made an immediate impact. Soon Manning, George Hendrick, Oscar Gamble, John Lowenstein, and Spikes were all competing for time in the outfield. If a player struggled, Robinson did not hesitate to sit him down. Spikes’s at-bats were down by 220 from the previous season, and he hit just 11 home runs. 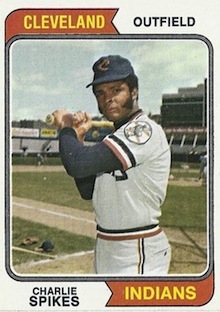 Spikes’s career continued on a downward spiral when the Indians demoted him to Triple-A Toledo in 1977. There, manager Jack Cassini briefly benched Spikes after he failed to run out a pop fly, loafed in the outfield after a base hit, and did not slide into second base to attempt to break up a double play. “If he doesn’t want to run out the damn ball, he can’t play for me,” said the Mudhens skipper. “If he can’t hustle, he won’t play here. Nobody makes this team look bad.”x But Spikes righted the ship and in July he was recalled by Cleveland, where in the meantime manager Robinson had been replaced by Jeff Torborg. Spikes languished on the bench for the last two months of the season, getting only 28 at-bats. Spikes was eager for a change of scenery and the opportunity to begin anew. “I’ve got a new start here with Detroit and I don’t even want to look back to Cleveland,” he said. “What is going to happen here has nothing to do with my past performance. Just judge me on what I do in Detroit, not what happened in the past.”xii But Spikes injured his knee and was sent down to Triple-A Evansville after just ten games. He played in only 16 games at Evansville, and then had knee surgery. He was released by Detroit on September 25, 1978. Spikes was a pinch-hitter again in 1981, getting 10 hits in 31 at-bats. He was released at the end of the year. He played in Japan for a year, suiting up for the Chunichi Dragons for almost three times his 1980 salary in Atlanta. “I did OK in Japan,” he recalled. “I think I hit 12 or 13 home runs, but it was tough to stay focused. I had trouble communicating.”xv He injured his knee again and came home for another operation. He was officially retired from baseball. Years later Spikes injured his back while working in a textile factory in Bogalusa. Three operations later, he was on total disability. As of 2012, he lived in Bogalusa with his wife, Marsha, and their two daughters, Kimberly and Leslie. Terry Pluto. The Curse of Rocky Colavito (New York: Simon and Schuster, 1994). i Ed Rumill, “Charlie Spikes: New Hope For the Indians?” Baseball Digest, June 1973, 33-34.
ii Ed Rumill, “Charlie Spikes,” 33-34.
iii Phil Pepe, “Yankee Brass Digs Spikes as a Future,” New York Daily News, March 2, 1972.
iv Jim Ogle, “Bunts and Boots,” The Sporting News, April 14, 1973, 43.
v Ed Rumill, “Charlie Spikes,”, 33-34.
vi United Press International article, March 25, 1973, in Spikes file, Baseball Hall of Fame library. vii Russell Schneider, “Spikes On Home Run Splurge, Makes Aspro Cautious Prophet,” The Sporting News, May 19, 1973, 20.
viii Russell Schneider, Whatever Happened to Super Joe? (Cleveland: Gray and Company, 2006), 52-56.
ix United Press International article, May 7, 1975, in Spikes file, Baseball Hall of Fame library. x “Cassini Benches Spikes For Lack of Hustle,” The Sporting News, June 4, 1977, 37.
xi Jim Hawkins, “Spikes Digs In To Win New Start With Tigers,” The Sporting News, April 22, 1978, 11.
xiii Ken Picking, “When Braves Feel Pinch, Spikes Goes on Warpath,” The Sporting News, June 16, 1979, 40.
xv Russell Schneider, Whatever Happened.